And what can she be, if we reclaim a vision for the things that made her great in the first place? 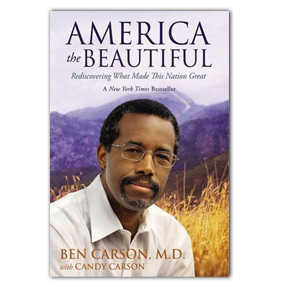 Now Dr. Ben Carson reveals his vision for retaking America in his New York Times best-seller America the Beautiful: Rediscovering What Made This Nation Great. In America the Beautiful, Dr. Carson offers Americans a stark alternative to the vision President Barack Obama has put forth. Dr. Carson argues that we must learn from our past in order to chart a better course for our future. Carson uses his own American success story — detailing his ascent from inner-city poverty to international medical and humanitarian acclaim — as the launching point for a journey of rediscovery of the fundamental truths and principles that made America such a great nation. Written by a man who has experienced America's best and worst firsthand, America the Beautiful is at once alarming, convincing, and inspiring. After reading this book, you will find out why Dr. Carson's remarks at the National Prayer Breakfast so angered President Obama and alarmed the national media. In America the Beautiful Carson shares his perspectives on our nation's origins, why our Judeo-Christian heritage remains so relevant and needed today, our failing educational system, and the great threat posed by Obama's socialism and healthcare plan. How slavery that occurred over a hundred years ago should not be used "to tip the scales forever"
Why government is the root cause of crises in Greece and Europe . . . and the possibility of such troubles in the U.S.
Fixing our healthcare — it's not about more money! This is not only Dr. Carson's manifesto — it is an American manifesto of the values that helped make Dr. Carson such a success, the same ones that shaped America's past and can make us great again! America the Beautiful calls us all to use our God-given talents to improve our lives, our communities, our nation, and our world. Dr. Carson has already been talked about as a presidential candidate in 2016 — making his book and vision even more timely and important to read. Get this book. Read it. Absorb it. And share it!